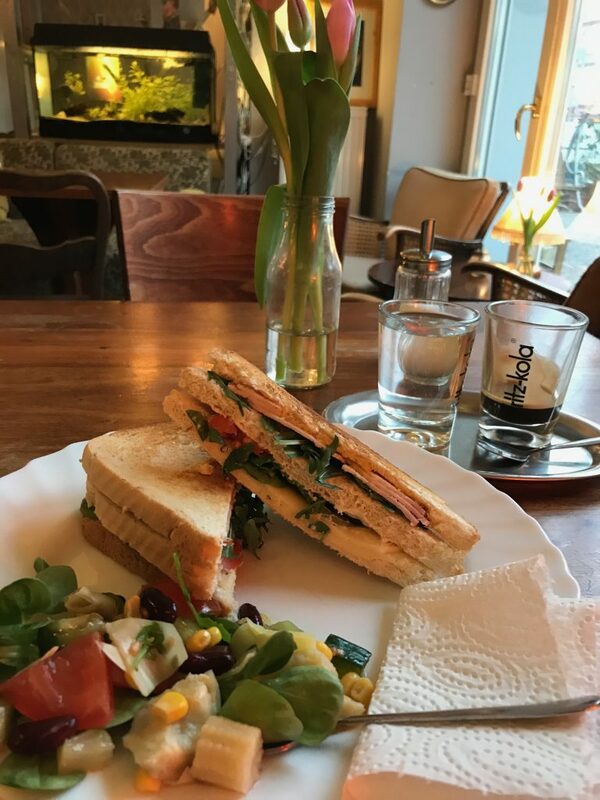 Already, I’d reached my last day in Berlin – so I decided to start the morning by treating myself to breakfast in the hotel. 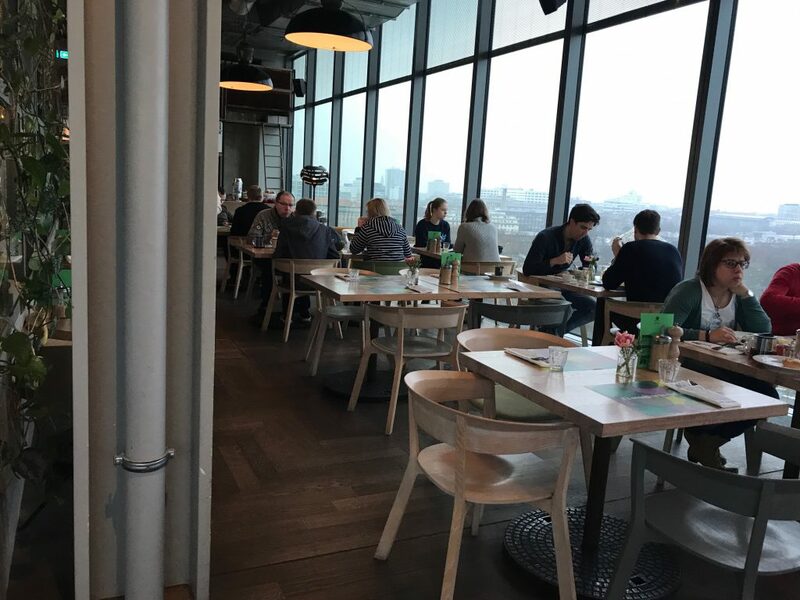 I headed up to the 10th floor restaurant, Neni, in the hotel – it was still busy at 9.15am on a Monday. 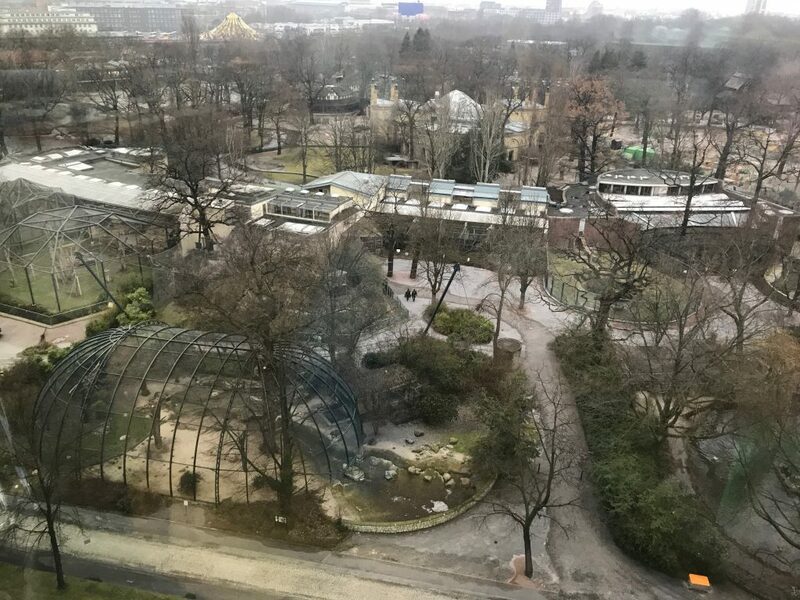 Annoyingly I just missed the last table by the window, so failed to get a view of the zoo, but really, I think it was far too cold for the wildlife to be out – taking a peek through the window, I couldn’t see any animal action at all! The breakfast was a buffet, and there was plenty on offer, with loads of jars of different sauces and stuff. 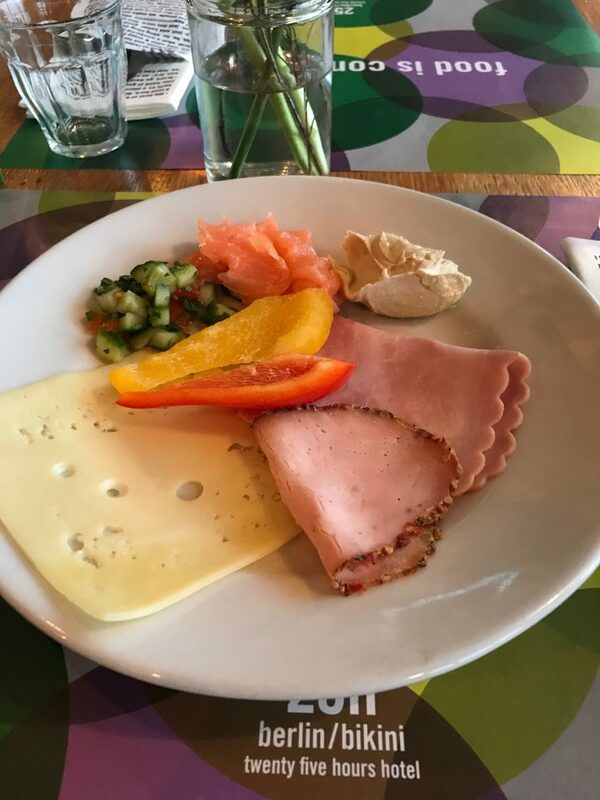 I started with some cold meat, smoked salmon, cheese, hummus and token vegetables, it had been a while since I’d seen vegetables! 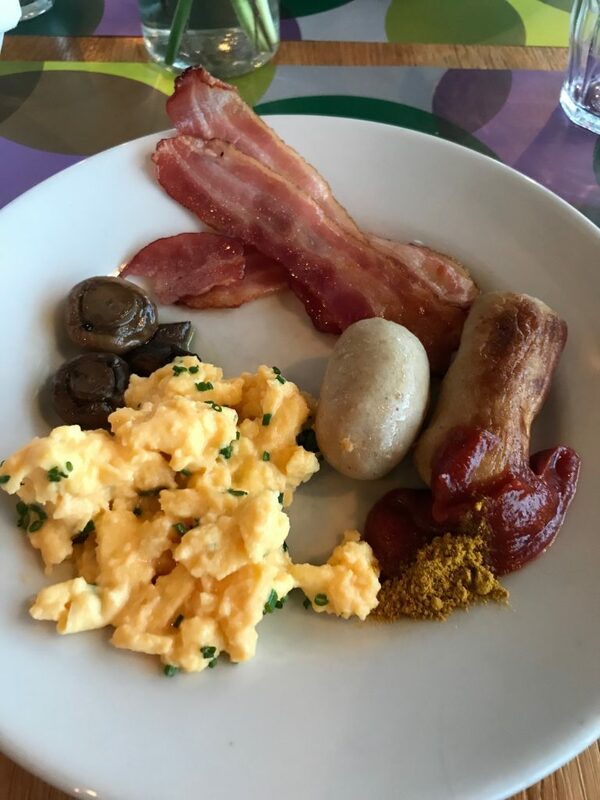 From the hot buffet, it was eggs, bacon, two kinds of sausages (no idea what they were), some currywurst sauce, and some mushrooms – a nod again to getting some veg in there! 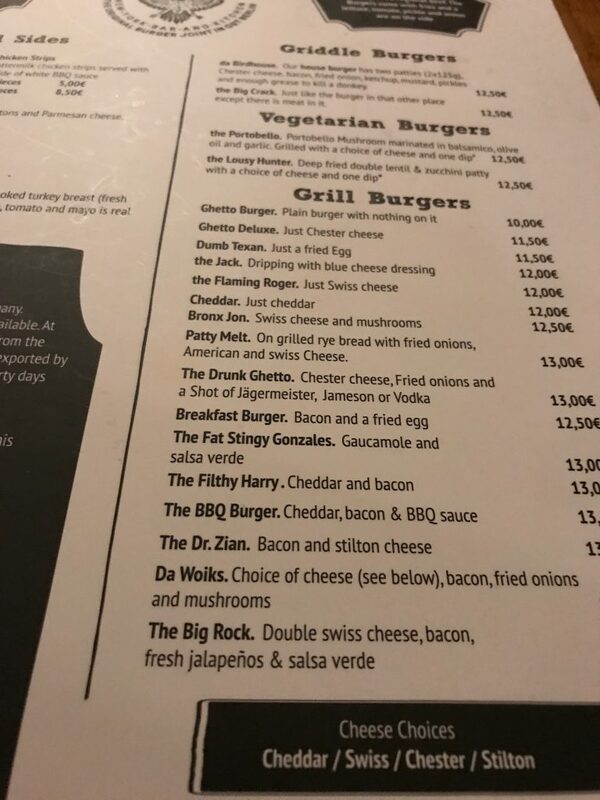 The breakfast costs €21 – it’s a fair bit, but then again I think breakfasts in hotels always are a bit on the pricy side. Given that, I thought it was good value. 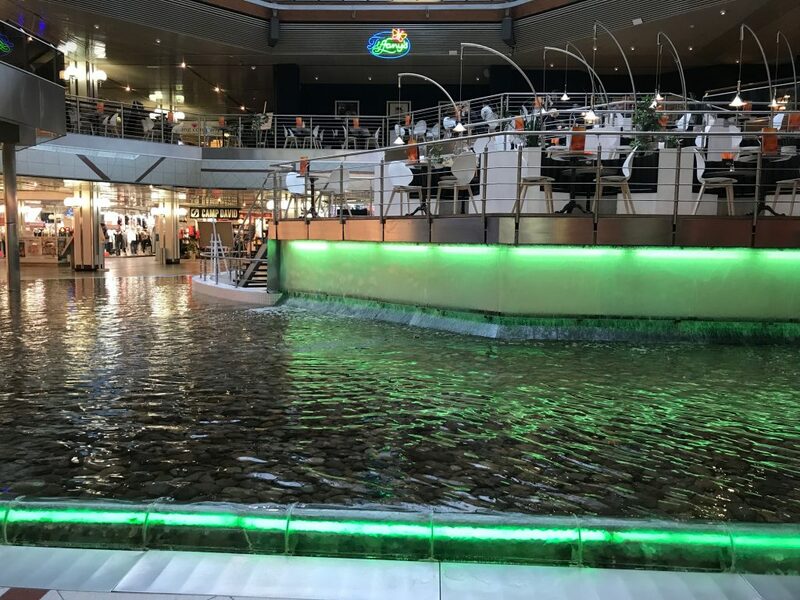 Being careful not to stuff myself full, I then headed across the road to the Europa Centre – a big shopping centre that looked like it had been untouched since the early 80s. Full of green neon lights and water features! Again I’d been having camera problems – my camera hadn’t been charging with the mini USB cable I’d brought, and after four days the battery was down to 15%. I headed into the large electronics store in the mall after it opened at 10am, and a helpful (though not exactly smiling) assistant helped me pick out the right cable and made sure it would charge my camera. Then it was back to the hotel for half an hour while my camera charged. 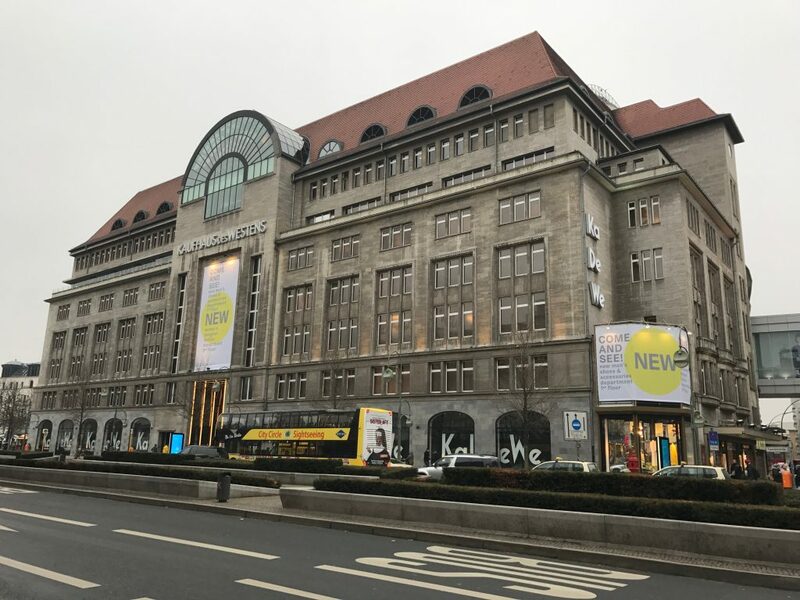 After that, I returned to the KaDeWe department store – it’s Berlin’s biggest and best, and I’d only really had a very quick scoot around it on Saturday morning. Once more I started on the sixth floor gourmet food hall and worked my way down. The food hall is amazing – there were more sausages than you could shake a stick at, and everything was exquisitely presented. 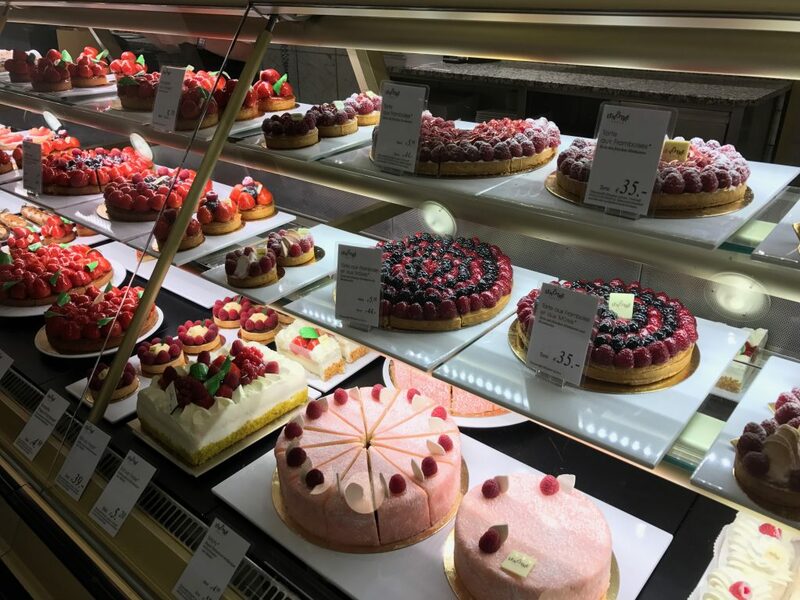 Take a look at these cakes! The food just looked delicious – and they seemed to have everything – I reckon you could do a full shop there every week and get everything you need, but I also think it would cost! Going down a couple of floors, I picked up some postcards and then had a wander through the toy department. I was sorely tempted when I saw these…. In the end, even after checking out the menswear, the only thing I’d seen that had tempted me to part with my cash was a Lego set of the Berlin skyline which I thought would make a cool souvenir, so later on I ordered it online to be delivered back home. 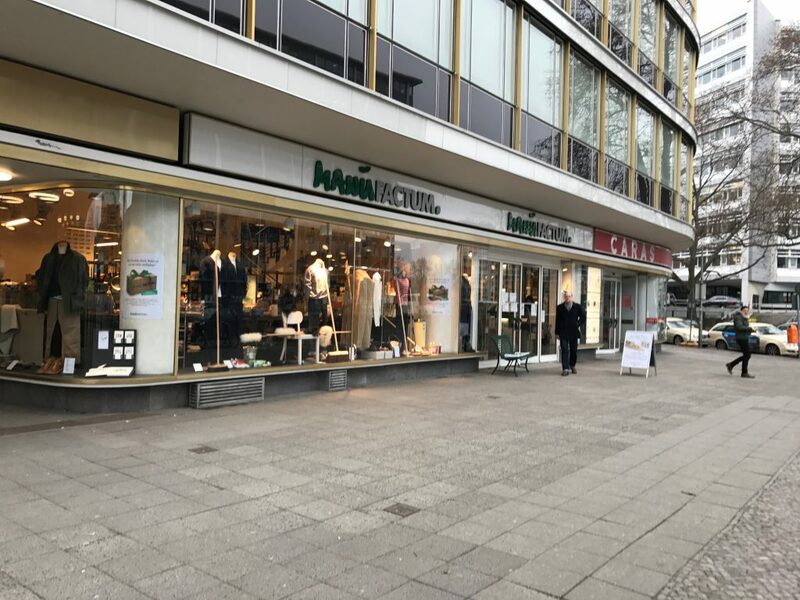 Next on my list for the day was another shop I’d read loads about in my guide book and online – Manufactum. I jumped on the S-bahn for a couple of stops to check it out. 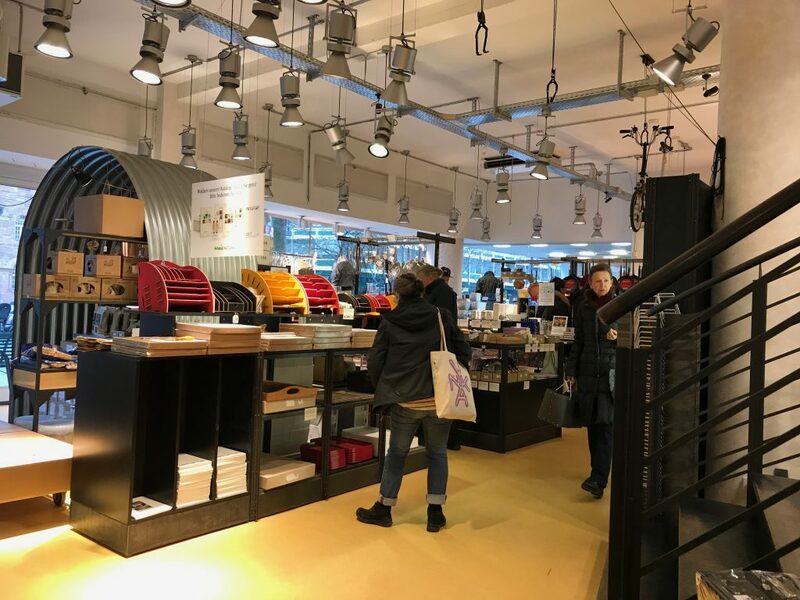 It was started in 1988 by a prominent green party politician to counter mass-produced goods, and is like a mini department store, selling everything from toys to kitchenware, clothes to gardening stuff and furniture. I thought it would be all cool and funky from the outside but er… not quite! It looked like an eighties clothes shop. Inside it was a bit more modern, and there was loads of nice home stuff in particular, but again nothing really tempted me to part with my cash, so after a quick wander around, I left empty handed. 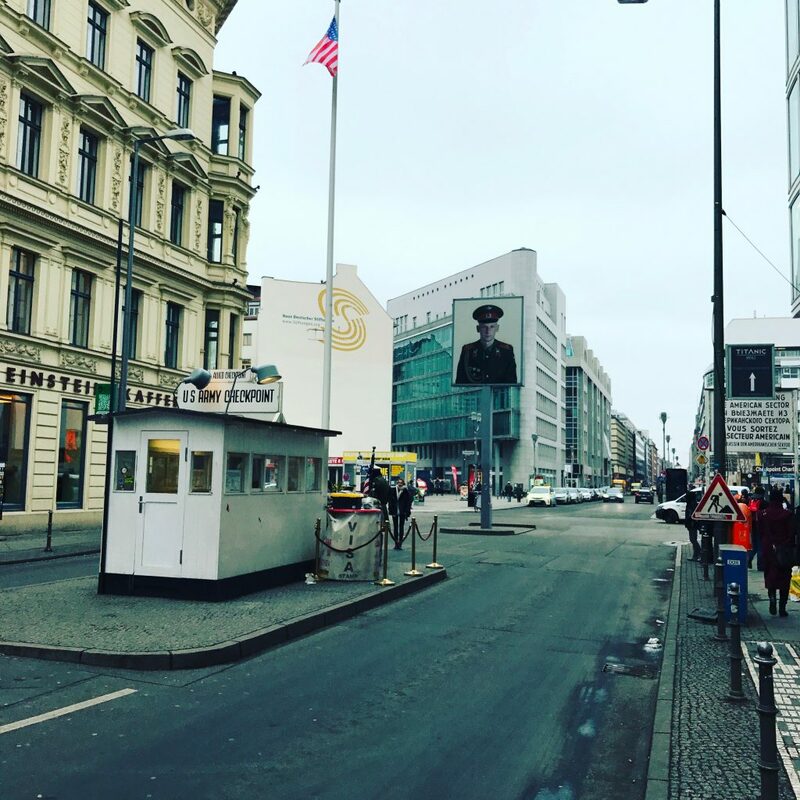 Back on the underground, I headed towards Friedrichstraße – and another Berlin sight I wanted to check off my list… Checkpoint Charlie. Arriving in August 1961, the small hut was an Allied sentry post which served as one of the main demarcation points between West and East Berlin. It’s been featured in loads of movies, so it was cool to finally see it in the flesh. But it felt really touristy at the same time. It was surrounded by souvenir shops and fast food restaurants, and ‘manned’ by guards who for a couple of euros would pose for a picture. I wasn’t tempted! 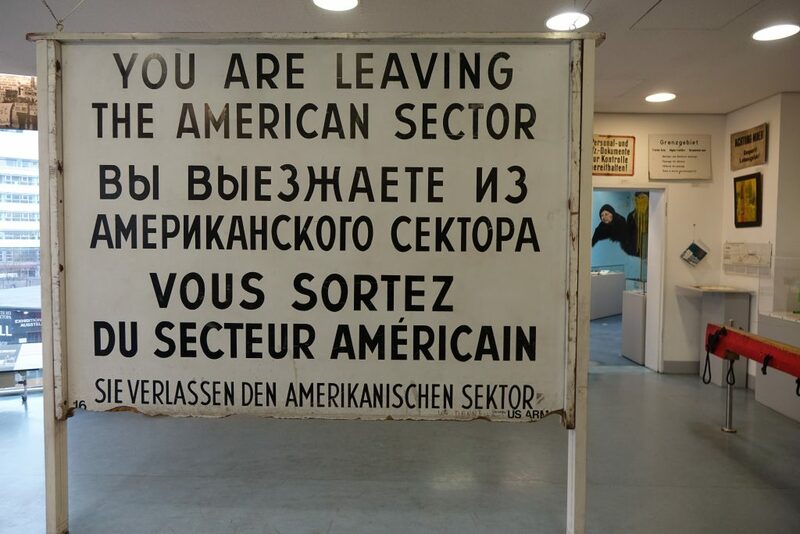 Just down the street from the actual checkpoint is the Mauermuseum – or the Wall Museum – Checkpoint Charlie. I’d read it was worth a look, so wandered in to the ground floor gift shop to buy a ticket, which ended up costing me a fair bit! I got a discount with my Berlin Welcome Card so entry only cost me €9,50 instead of €12,50 but there was an additional FIVE EUROS charge to pay for taking photos! I thought that was a bit steep – and a rip-off. 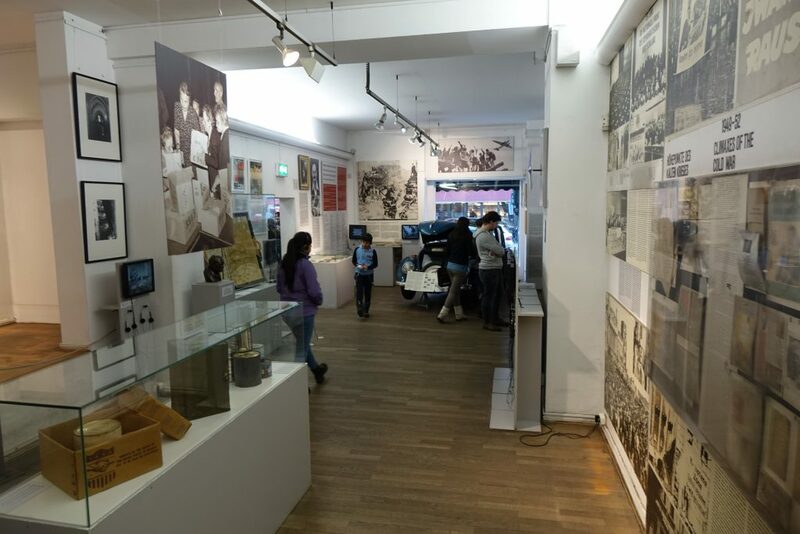 There’s a good bit of history behind the museum itself – it was opened just over a year after the wall went up, by a human rights activist as a reaction to the wall’s construction. Originally it was located in a two bedroom apartment, but after being overwhelmed with visitors, it was forced to move to a larger location not long after opening. It’s misleading in size from the outside – inside it’s enormous, but I think that’s part of the problem – rooms lead to more rooms, and there’s just no signage or logical flow to let you know which order you’re meant to go ’round the exhibit in. I frequently found myself in a room (thinking I must be going the ‘right’ way) only to have jumped forward several decades in time. 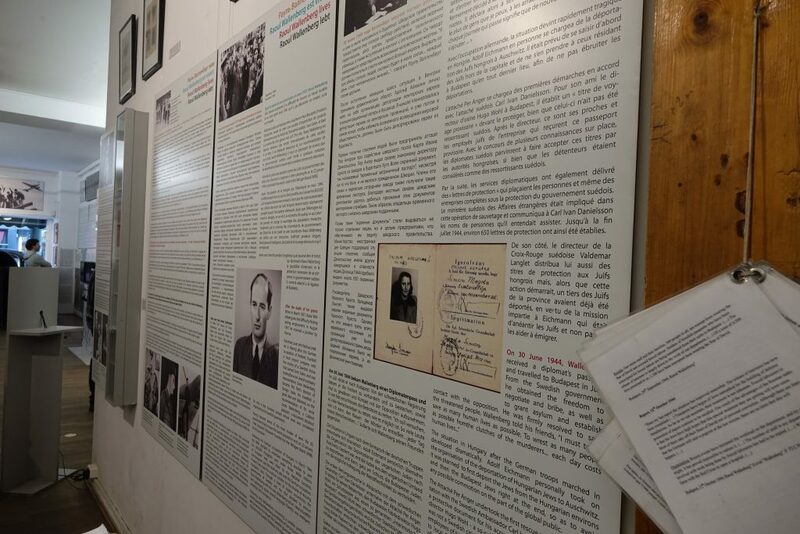 Also I have never seen so much to read in a museum – every wall was covered with long paragraphs of really dense text. I just didn’t have the time to stand and read everything, and couldn’t really be bothered either! 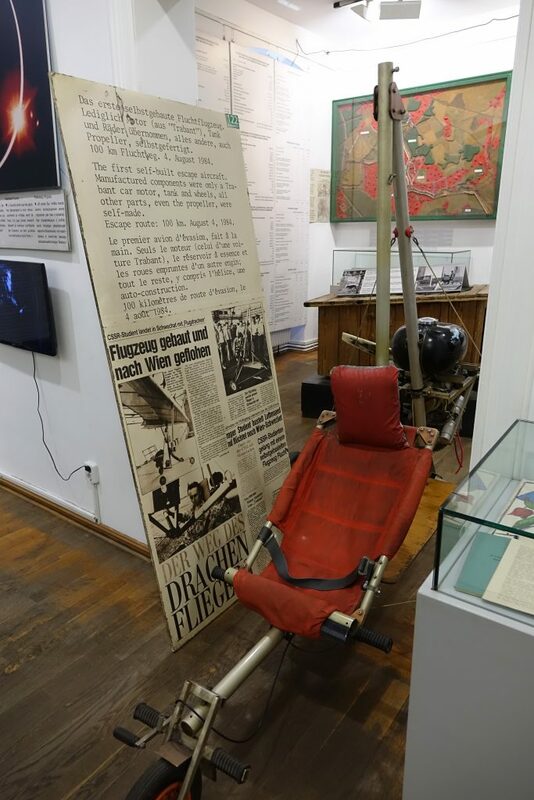 Saying that, there were some gems on display – particularly to do with the ingenious escape methods people in East Germany used to get smuggled across the border. 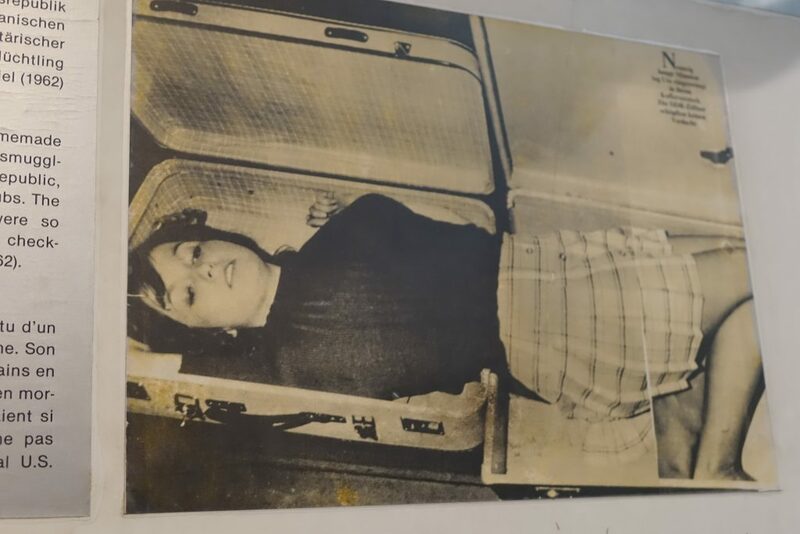 This woman squeezed herself into two suitcases. Some people built their own aircraft – imagine flying over the wall on a cold Berlin night in that! There was also an incredible story about a man from West Germany, Georg, who fell in love with an East German girl called Liane and was determined to get her across the border. 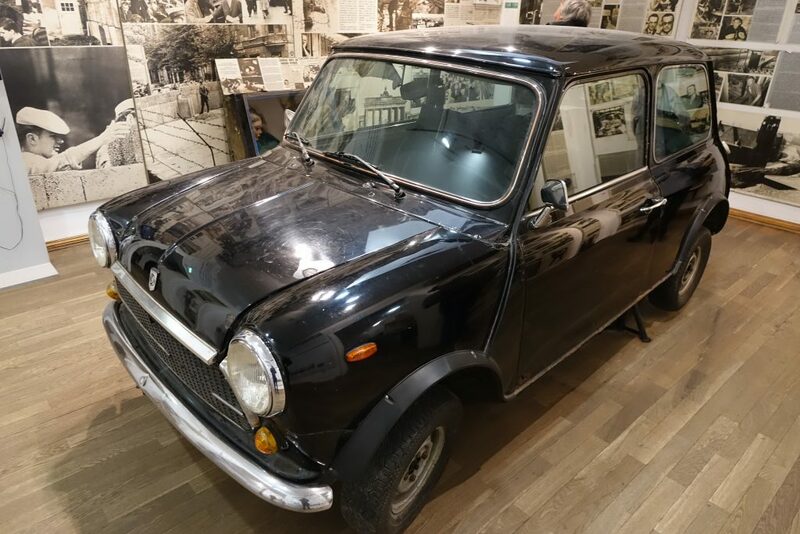 Eventually the pair decided to use Georg’s Austin Mini – with Liane hidden inside the car’s passenger seat. That must have been painful! I think, but I’m not 100% sure, that that’s Georg’s Austin Mini in the picture above. All these exhibits and stories just made me think about how desperate East Germans were to escape their country. It must have been terrifying preparing to trying to get across the border – with the constant fear you’d be caught, and your head filled with thoughts of the consequences you’d face if you were discovered. 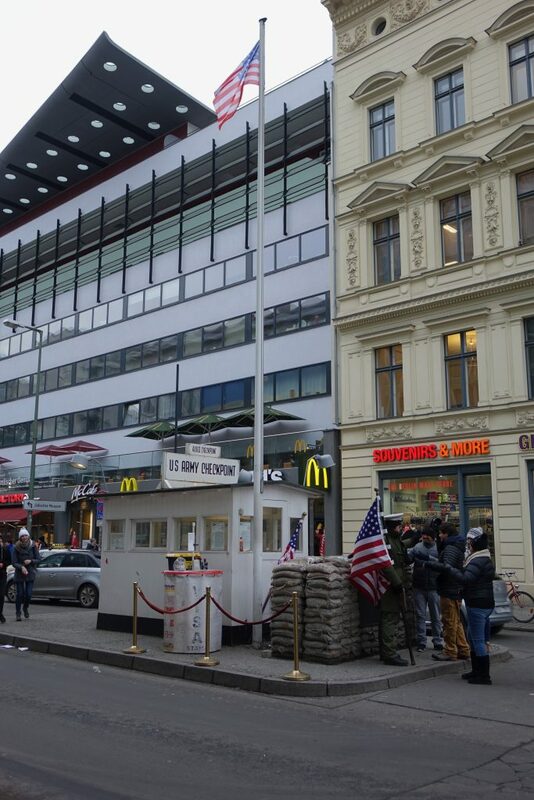 After seeing more daring tales of escape, I saw another Checkpoint Charlie sign – the real one? Who knows! All in all, I’d say the museum is probably worth a visit, but I skipped a whole load of rooms that seemed to be about NATO and Ronald Reagan. I thought I might pick up a souvenir in the gift shop, but although it was massive too, it was full of tacky stuff. 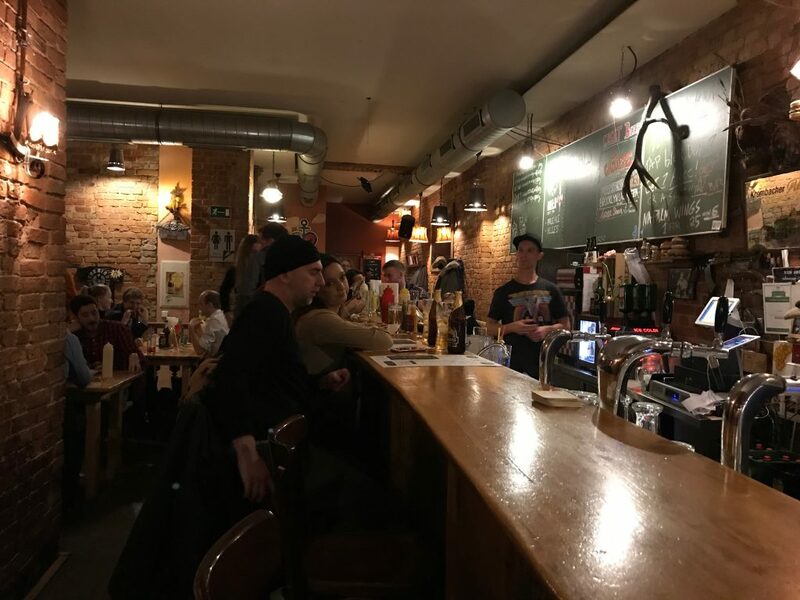 With my stomach rumbling, I decided to head off for lunch – and to a spot a friend had recommended as having the best burgers in Berlin. It was half an hour away on the train, but I was hoping it would be worth it! 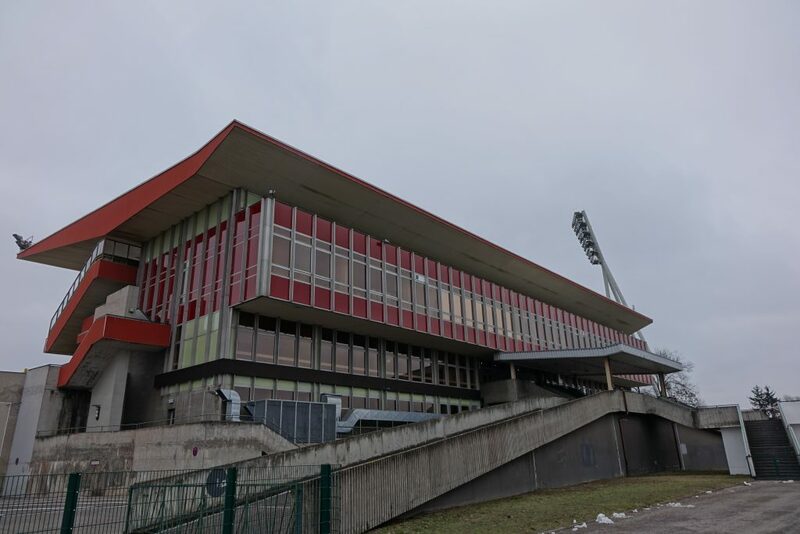 After getting off the U-Bahn, I opened up Apple Maps and headed off up a path which took me past the main stand of a sports stadium – a fine example of Eastern German brutalist architecture if ever there was one! For some reason, I just find buildings like that really creepy. Their kind of abandoned look doesn’t help. Apparently the stadium was renovated to host the UEFA Women’s Champions League in 2015, and is due to be either completely renovated or rebuilt in 2018. After walking for ten minutes I arrived at The Bird! I was more than ready for my burger, but…..
… it was closed. I could have kicked myself for not checking the opening hours before I made the trip! It’s only open for lunch on Saturdays and Sundays. Disappointed I made my way around the other side of the sports stadium, walking through Mauerpark. It’s the site of a lively flea market on a Sunday, but today it was looking a bit drab. Checking my guide book to see what was in the area, I saw I was only five minutes away from a shop called VEB Orange, so I headed there for a browse. 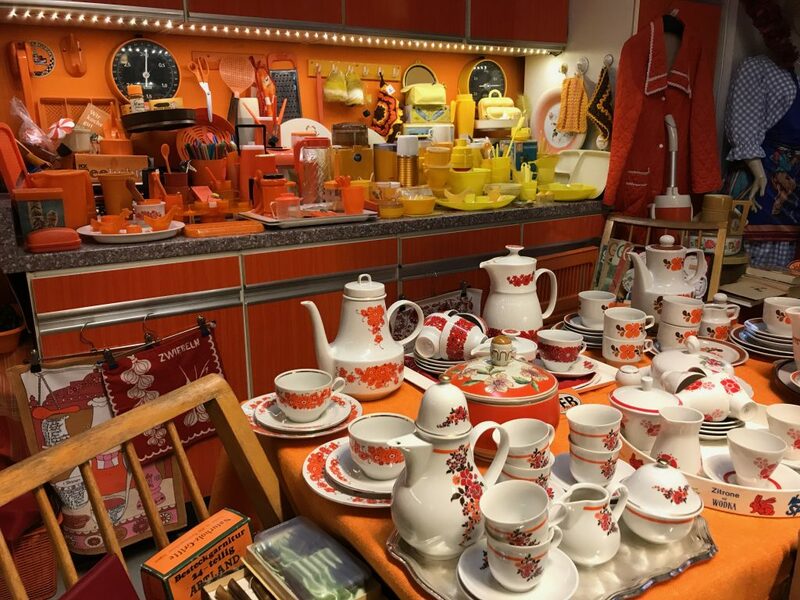 Situated on Oderberger Straße, the shop sells home goods, clothes and accessories from 1960s and 70s East Germany. Inside was absolutely rammed with goods from the former GDR. Badges, cameras, records, books, clothes, you name it, it was in there! There was a sign up saying photos weren’t allowed but sneaking into a backroom I managed to get one…. Literally the place hurt my eyes! Bright red, yellow and orange plastic kitchen accessories littered every surface. I saw an old East German camera I was tempted to buy for €15, and in hindsight I wish I had purchased it, but at the time I thought it would probably just sit unused taking up space in my flat. By now I’d really had enough of walking around and just wanted a seat and something to eat. 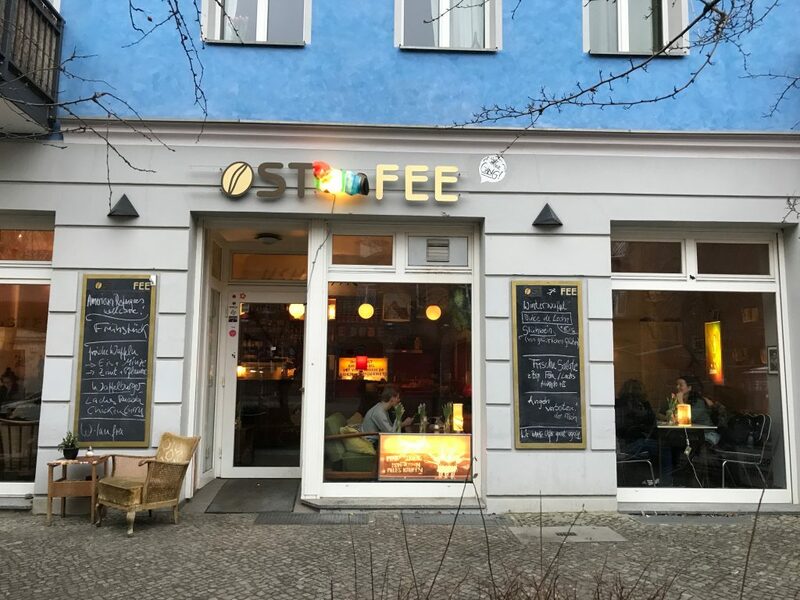 I was preparing to set out on a 20 minute walk to a cafe mentioned in my guide book, when I saw a place called Ostfee across the street. Too easy! I headed in. It was really cosy and warm inside, so I ordered a coffee and sat down to have a browse of the menu. But it hit the spot! I warmed up, and sat for a while writing postcards and thinking about what to do for the rest of the day. 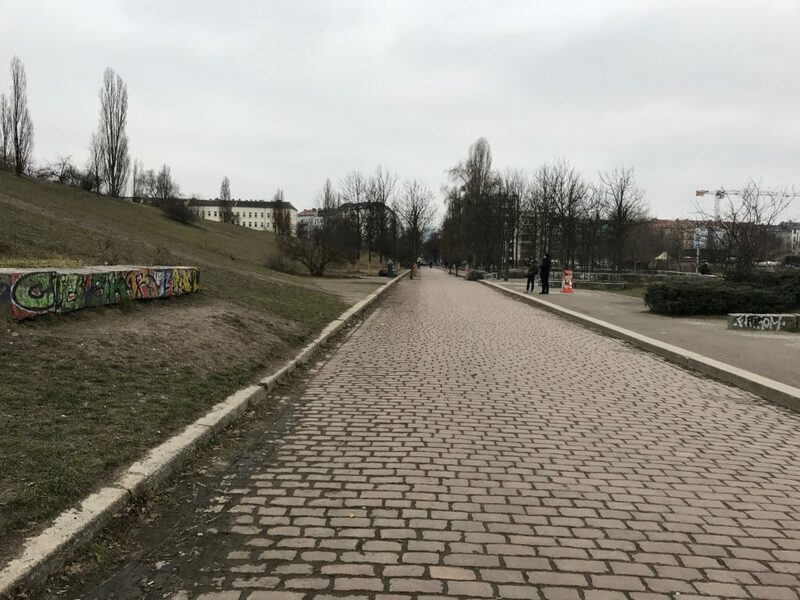 By now it was about four o’clock, and night was already falling, so I decided to hot foot it to the last of the Berlin sights I’d had on my list – the longest standing section of the Berlin Wall still standing. Round the corner from Ostfee I jumped on a tram which was mobbed – and full of parents with prams. Twenty five minutes or so later, I got off at the Warschauer Straße station stop. It was bitterly cold – once again. 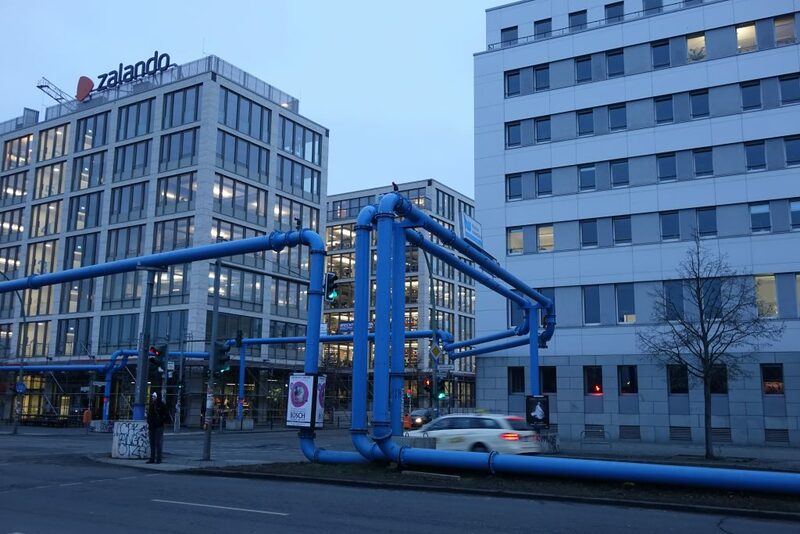 Before I saw reached the wall section, I saw – not for the first time – these weird pipes in the middle of the road. Still not quite sure what they’re all about! Then I arrived at East Side Gallery. 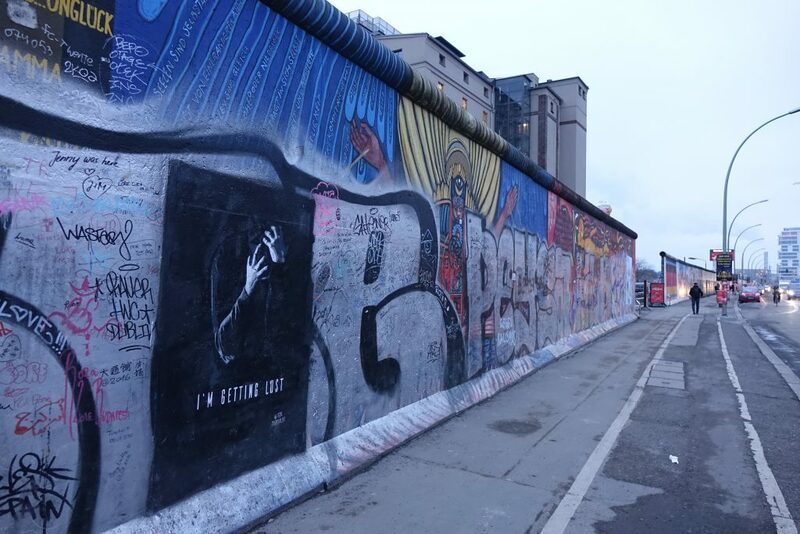 Located along the banks of the Spree, it’s a 1.3km stretch of the wall, which was painted by 118 different artists from 21 countries just after the wall came down. The wall’s weathered greatly in the near 30 years since the rest of it came down, meaning some of the art had to be restored in 2009. But it was cool being near such a big piece of history, and seeing for myself what had divided the city for so long – and how high it was. 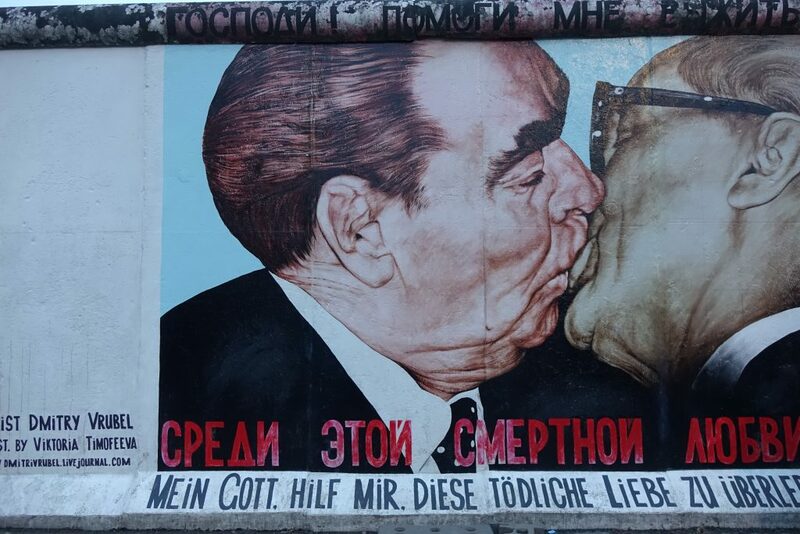 I’m not going to lie – I was so cold, I didn’t really walk very far – I got to this recognisable portrait of Honecker and Breschnew kissing, grabbed some photos and then turned around to get back to the warmth of the train station. 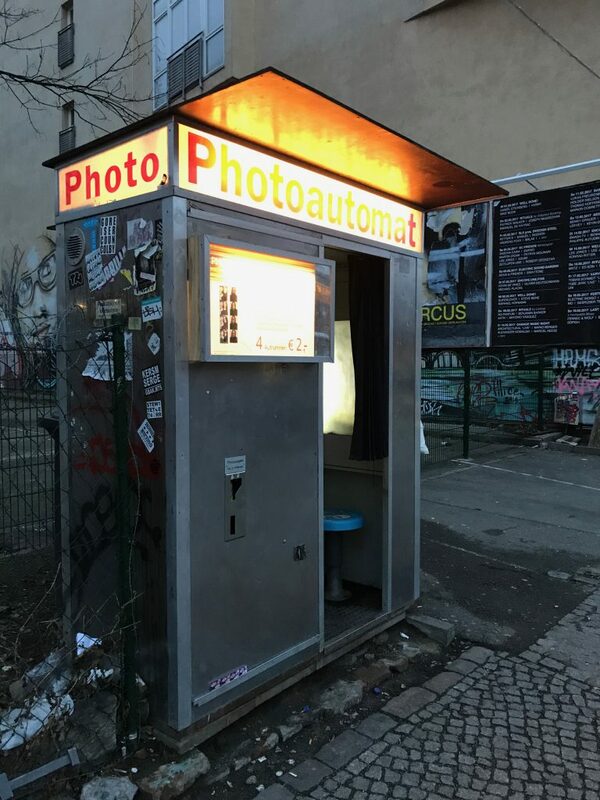 On my way, I passed two photoautomat machines – they are literally all over Berlin. While digital photo booths are the norm now, back in 2003, two guys had the idea of restoring old analogue units, and placing them back on the streets of the German capital. It seems to have taken off! I saw loads when I was out and about. Thinking it would give me another wee souvenir from Berlin, I headed in to the booth, dropped in my 2 euros, posed, and then waited outside on the freezing street. 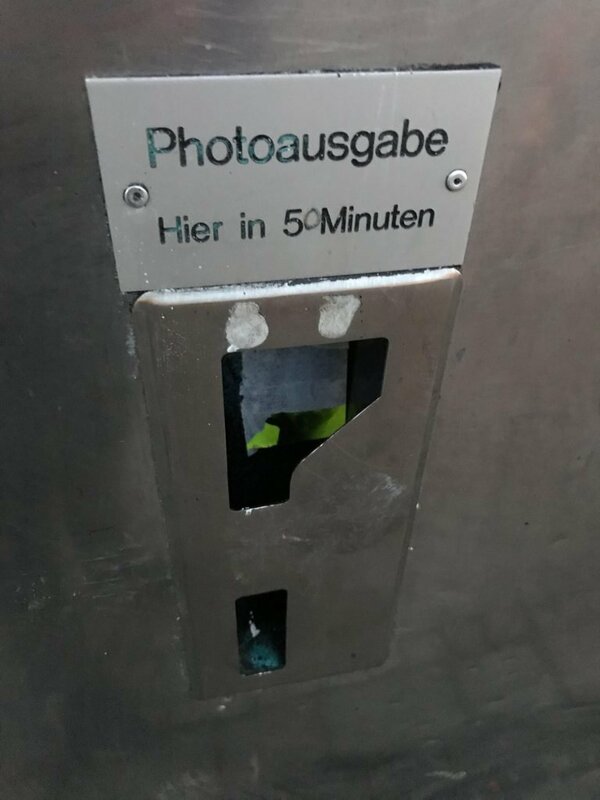 Looking again at the photo slot I saw someone had altered ‘5 minutes’ into ’50’. While I waited, three different people used the adjacent booth and walked away with their photos. Just my luck! My teeth were chattering, and yet again I couldn’t feel my face, so I decided to cut my losses and head in to the other booth. Five minutes later I was finally in possession of a strip of four grainy black and white photographs, and headed off back to the hotel. Who knows if my photos ever appeared from the first machine? 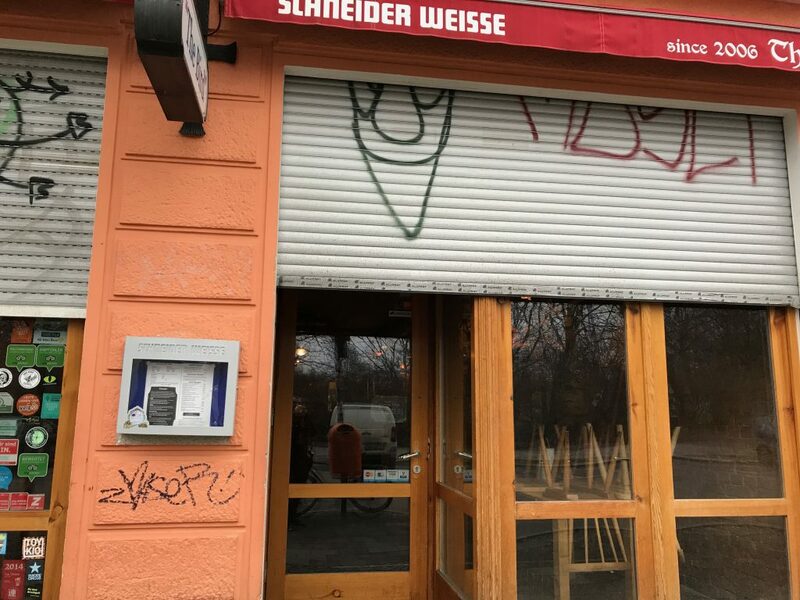 Maybe they’re on some Berliner’s wall now…. I’d mentioned earlier my hotel was next to a cool shopping mall. 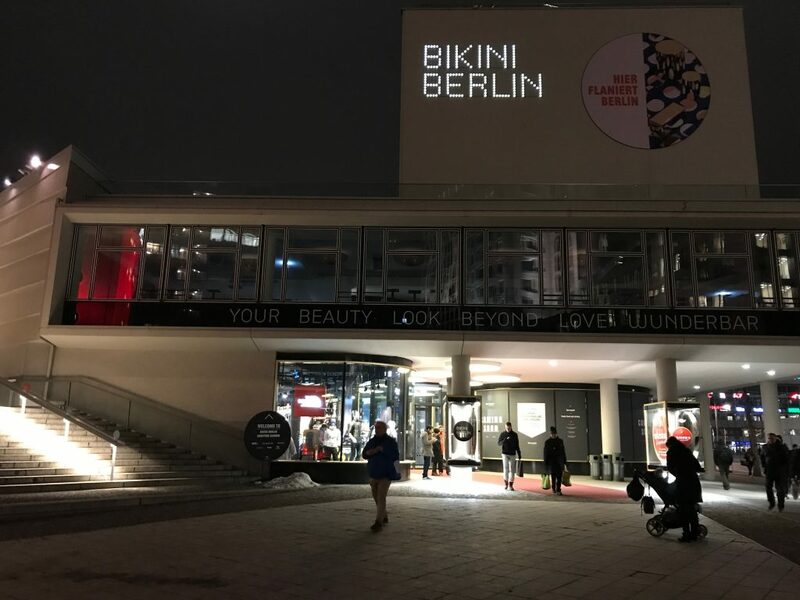 It’s called Bikini Berlin, and has some interesting designer shops in it, as well as a couple of restaurants and cafes. I hadn’t really had time to wander around the mall properly, so went in for a bit of a stroll, given this would be my last chance to check it out. 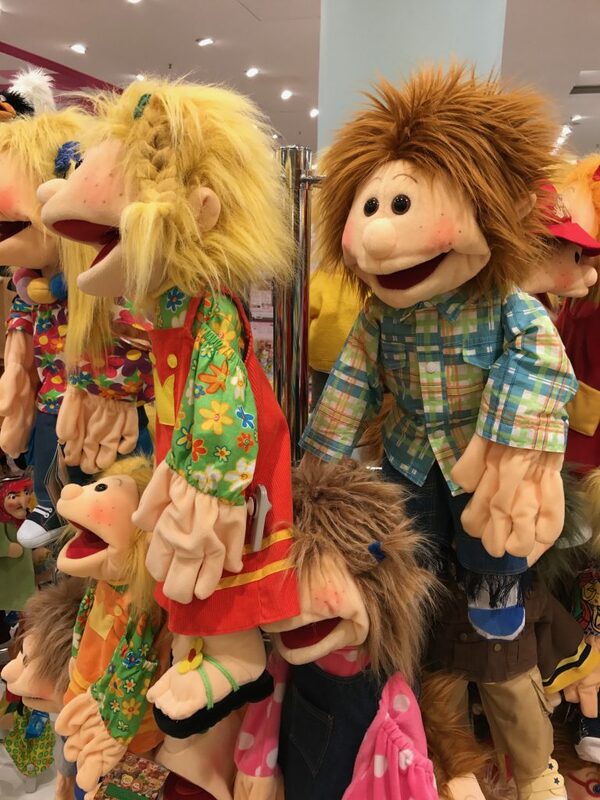 My tip if you’re near the mall and needing some souvenirs from Berlin would be to head to a shop called Promobo. 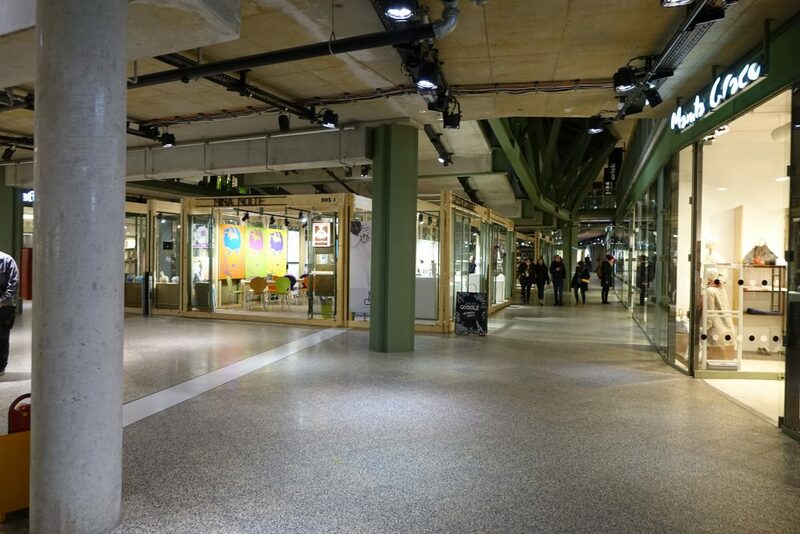 They’ve lots of quirky designer items – some made or designed in Berlin – as well as pictures and prints. I picked up a lightening port operated fan for my Mum that I thought might come in handy in the Dallas heat, as well as a picture of the TV Tower at Alexanderplatz for myself. Getting back to the hotel, I fancied a bit of chilling out before dinner, so decided to drop in to the hotel’s sauna. I picked up a bag from reception containing a towel, bathing robe and slippers and headed up to the 9th floor. 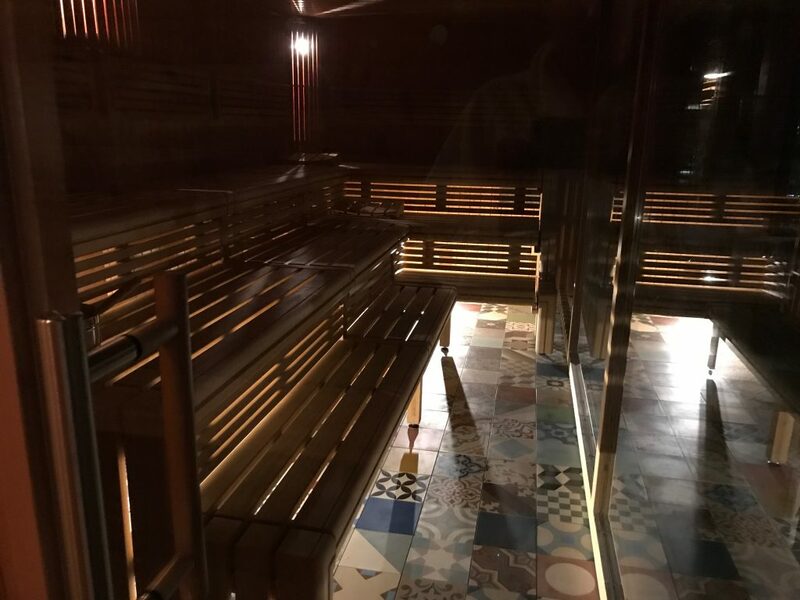 Not the best photo sorry, but the ceiling to floor window in the sauna offered a great, relaxing view. I stayed in there for as long as I could stand – it had been yet another cold day, so to relax in the warmth was great. I grabbed a quick shower and then was ready for dinner, but then faced a slight dilemma. I felt I’d spent the whole day jumping on public transport and really couldn’t be bothered going out again. But at the same time a sandwich in my room didn’t feel like the best way to round off my trip. 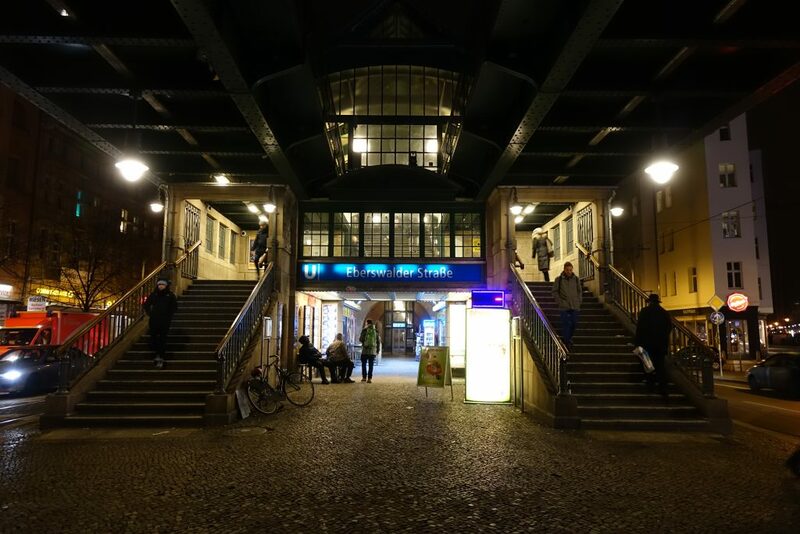 In the end I decided there was nothing for it but to head back to the station, travel back to the Prenzlauer Berg part of town, and return to The Bird. 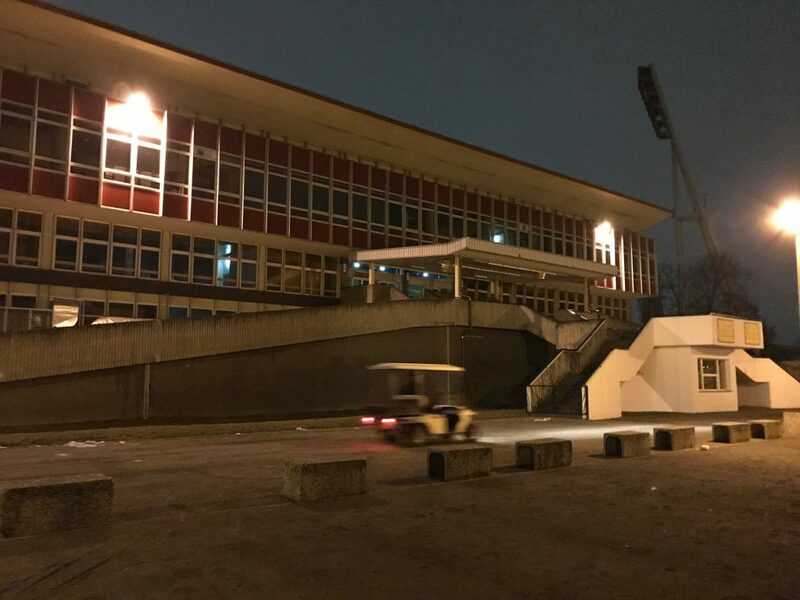 That familiar stadium looked even creepier by night – and the path leading past it was deserted, but weirdly I didn’t feel unsafe. Arriving at The Bird, the shutters were up.It was open! Inside was pretty busy with – from what I could make out – mostly tourists or ex-pats – the staff all seemed non-German too. 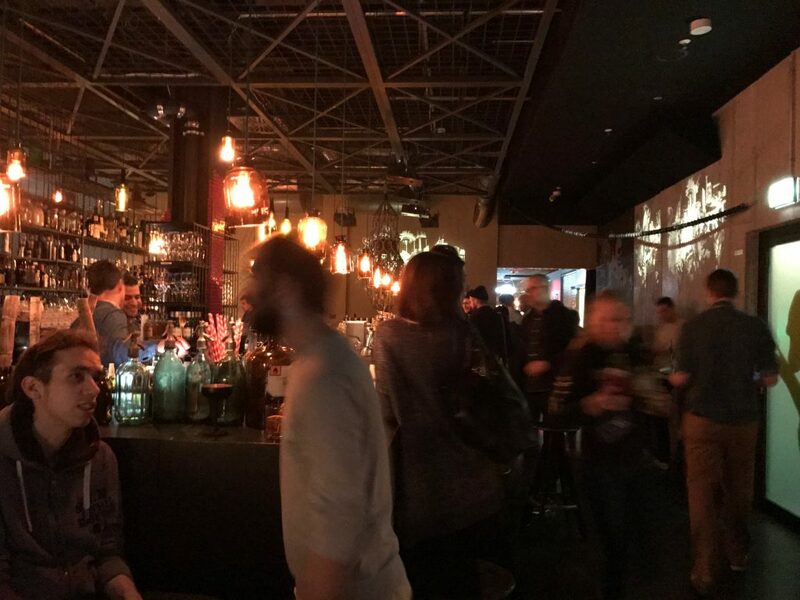 There was a lively atmosphere, but it wasn’t too noisy, and I grabbed a seat at the bar. 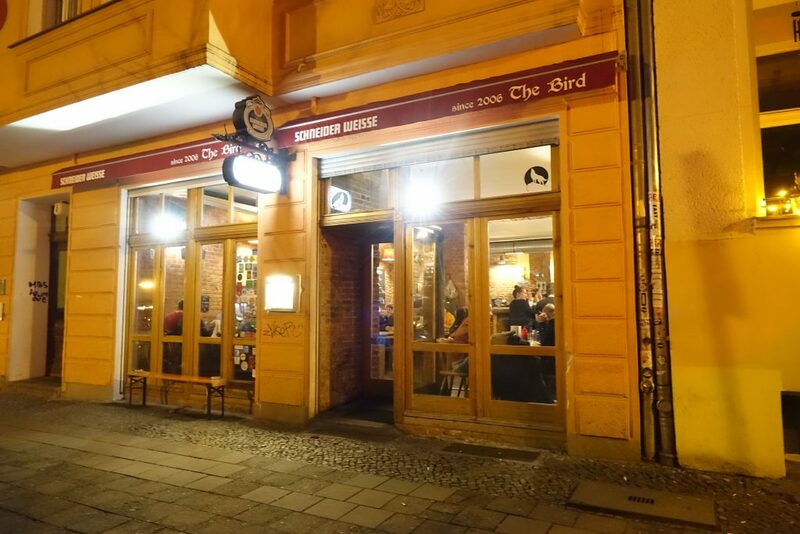 The Bird’s known for its burgers – so even though I’d had a bit of burger overload since I arrived in Berlin, I thought I might as well end my trip with one more…. I really cannot believe how small it looks in this picture. It was absolutely enormous. 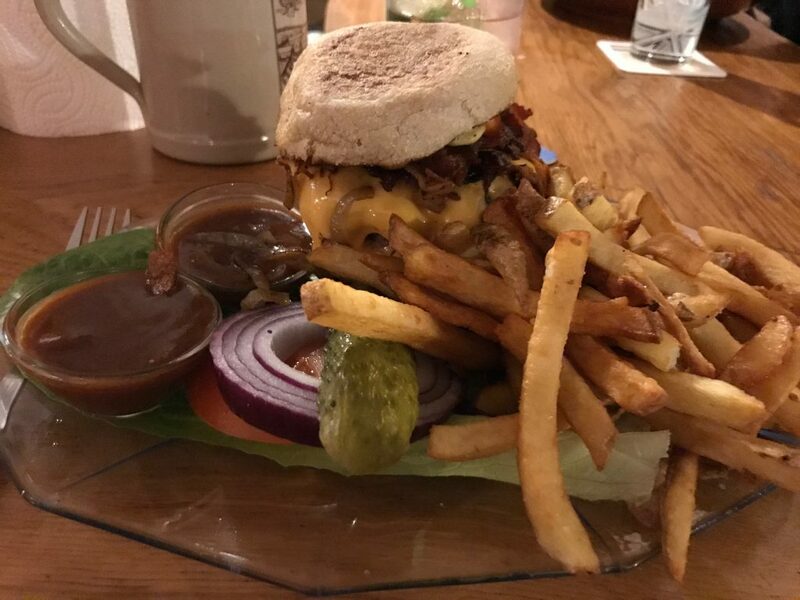 There was a note on the menu saying staff are fed up with people eating their burgers with a fork and knife, but there was no way I could eat this baby by hand without making a serious mess, and there as no way it would fit in my mouth either! I’d describe the burger as probably very unhealthy but at the same time one of the most satisfying things I’ve eaten in a while. It was just meaty and filling and slightly sinful. I loved it – thanks for the tip (once more) Debbie! 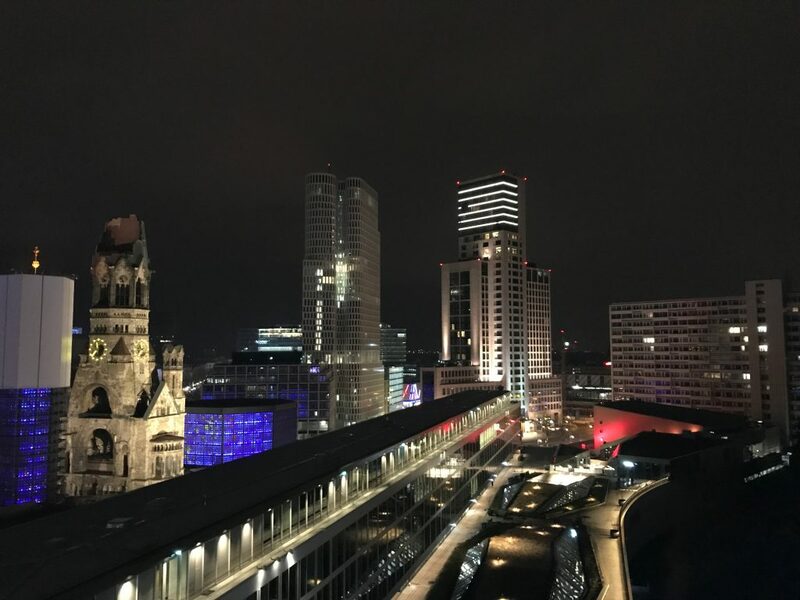 Jumping on Berlin’s public transport for the seventh time that day, I was back at the hotel for about half past nine, and decided to round off the day with a glass of vino in the Monkey Bar on the 10th floor. I’d kind of avoided this bar since I’d arrived, as I heard it was constantly packed – even though residents had their own separate entrance, I think most of the customers are non-residents. I’d guessed on a Monday night it would have been a bit quieter, but I was wrong – opening the door, there wasn’t a seat free in the place, and it looked like the party was only getting started! 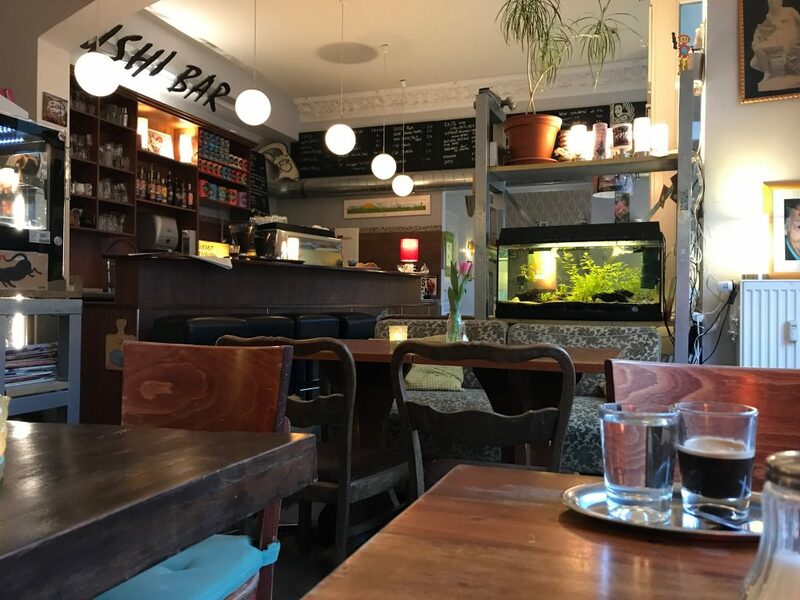 Service was really efficient, and conducted in a way I hadn’t seen before – one person took your drinks order and put it into a handheld computer, while other people obviously only made drinks and didn’t take any orders. Despite that it took a while for my glass of Riesling to arrive. 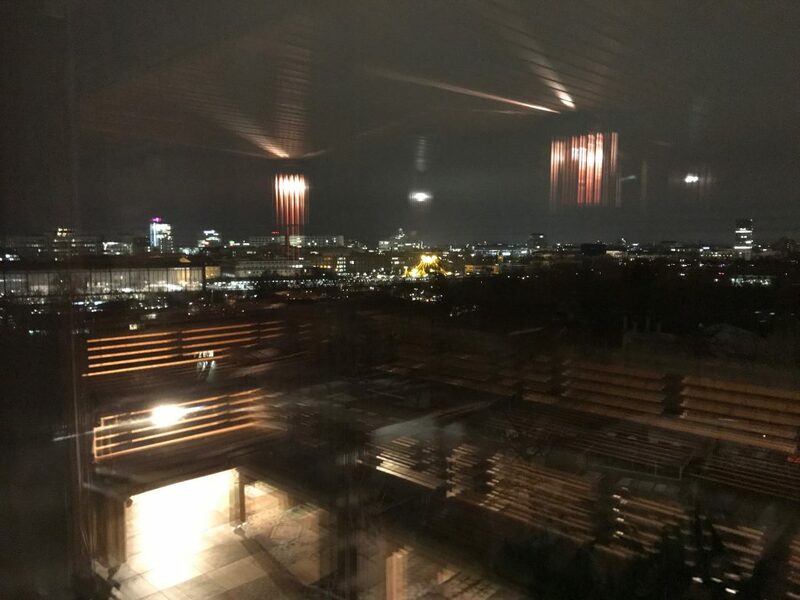 There weren’t any seats inside, and I didn’t really fancy hanging around looking awkward by myself, so I headed out on the patio for one last look at Berlin from above before heading to bed. I’d really enjoyed my time in Berlin – and seen a lot, but I think yet again I’d just tried to cram too much into each day really, failing to just chill out, soak up the atmosphere and discover those hidden, non-touristy places you come across by just wandering around. Five days had just seemed like to short a time to see everything the city has to offer. 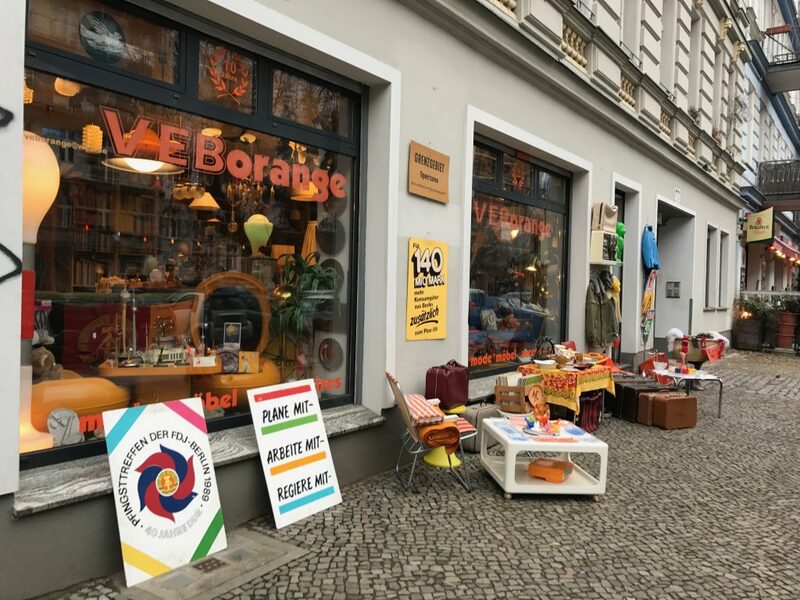 I hadn’t really seen the alternative side of Berlin, for example, so I think the city is ripe for a revisit – on a trip that’ll perhaps be a bit more relaxed. 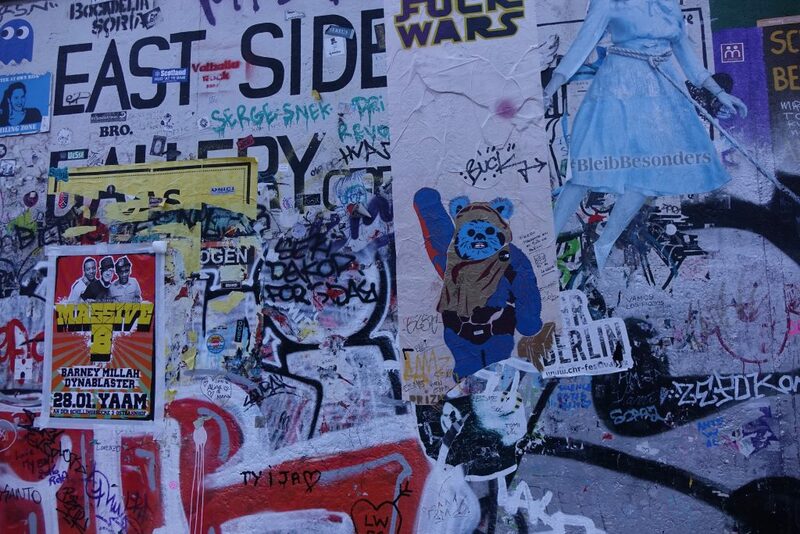 If you haven’t been, I’d definitely recommend a trip to Berlin – it’s friendly, and there’s so much to see and do – perhaps just too much!